Ah, yes, with video. The greats talking about music and the arts. This will eventually be fleshed out as I share certain “interviews” I have done with really great minds in service to the music. A speaking version of the Algonquin table. Here begins auspiciously with the great film and opera director and designer, all around genius, Franco Zefferelli. These are from an interview of 1983, not one of mine. A lovely conversation with the great diva and lovely lady, Montserrat Caballe perfectly hideous question about weight handled so full of charm. FANTASTIC clip of Elisabeth Schwarzkopf and her absolutely valid demands for a true legato and for the one thing she found hard to find, IMAGINATION. Hugely important clip for young singers. TEBALDIANI ALERTA !! 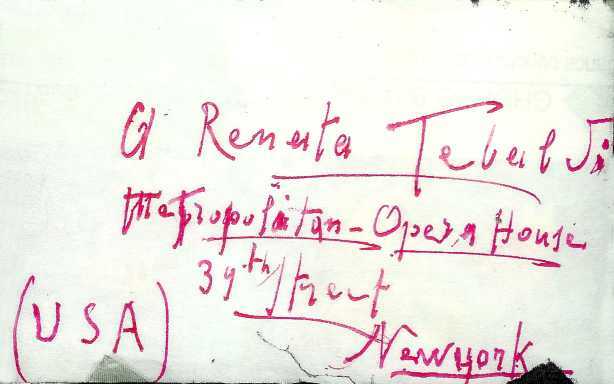 !for a real treat this is a foto of the envelope and a letter from Toscanini to Renata Tebaldi. It was displayed in Parma during the first exhibit of her museum tour. I sincerely hope it goes to New York. A provocative discussion amidst the chaos of travel with Stravinsky. This is priceless. An example of the young singer “singing” and Lotte BEING the text.Jeannine Wagner is the lovely young voice and Gwendolyn Koldofsky, piano (who judged me so very favorably for my first award at 16 years old singing “Casta Diva”. First Prize for the LA Bureau of Music Competition. She was an amazing friend after! )”Sonntag” (Brahms)You must click on the face of the video to go to youtube to watch this clip as they did not allow it embedded elsewhere.Click and come back. and even more rare and priceless, her discussion from her immense heart and experience about one of her greatest roles, that of the Marchellin…… These great clips of Luciano…. his manner is so easy and natural. I ADORED his Father. 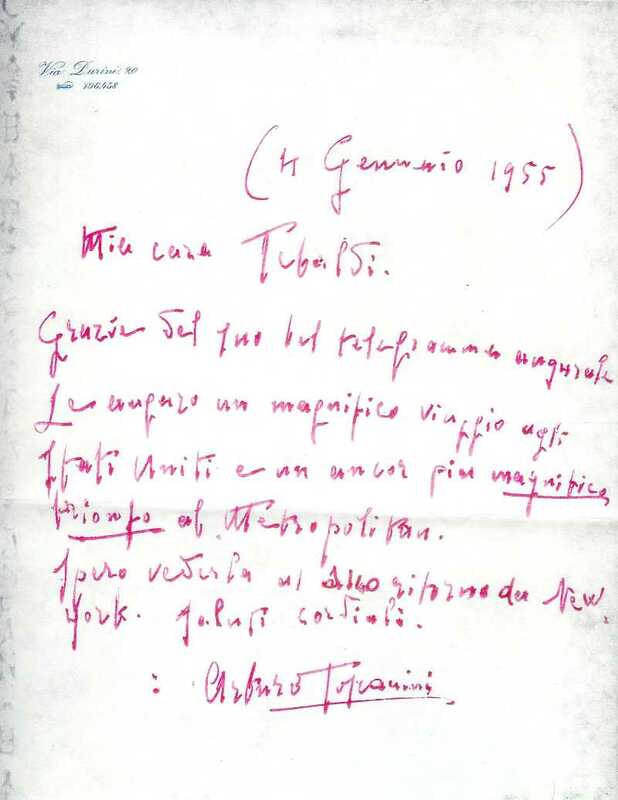 We got along like old pals, he was so supportive in my early days in Italy. He loved my voice and was always at my rehearsals in Bologna and Verona on occasion with great advice and words of history and support. I just loved him. This clip makes me cry. What a fine, upstanding, terrific personality he was, and Adele. Great people. Look at the love and respect in Luciano’s eyes and demeanor. His father is nervous of course, and says so. That he had been singing before this show perhaps too much. At almost 80!Luciano’s face as his Babbo sings makes me adore and respect Luciano even more. Great son, great man. The world stops and takes notice……one of the saddest days for all mankind. A great soprano, Anita Cerquetti, in a wonderfully lit and very unusual interview. Ezio Pinza in one of the last interviews of his life. Franco Corelli discusses briefly the historic Turandot at the Met with Nilsson and Moffo. A great tenor with a big heart. Here then is the complete and very intense documentary done on Maria Callas, with a kind of you are there feel. A tad intrusive, as she was so incredibly private, but as a time capsule, a way to walk with her her most impressive and legendary life it is a must. Brava, dear, Maria. You are really something special. To end there is a little snippet where she discusses her concept of trills for the Julliard Masterclasses.